Our holdings include the scientific work and achievements of distinguished scientists and Nobel laureates including the J. Craig Venter Institute History of Molecular Biology Collection (formerly The Jeremy Norman Collection), the papers of J. Craig Venter and Hamilton O. Smith, the Sorcerer II Expedition papers and others. The collections encompass a wide breadth of archival materials in both digital and paper formats which provide insight into the development of molecular biology, its allied fields as well as many of the key scientific discoveries that have shaped our world over the last 100 years. 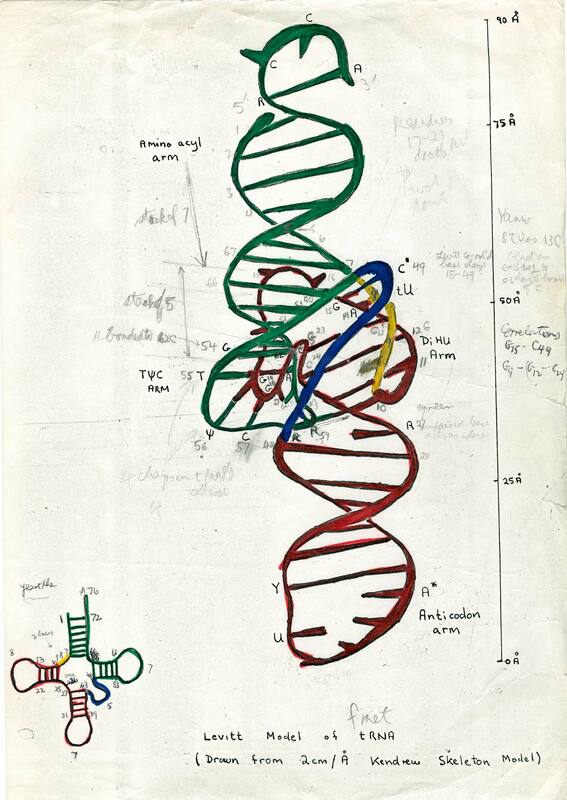 Hand drawn illustration of tRNA by Sir Aaron Klug from the proposed Levitt Model, circa 1969. Aaron Klug and colleagues were the first to obtain crystals of tRNA and one of two independent labs (Klug and Alexander Rich) to determine its structure in 1974. J. Craig Venter Institute History of Molecular Biology Collection is comprised of materials which document major scientific breakthroughs that led to the founding of molecular biology. Archival materials include correspondence, publications, manuscript drafts and unpublished works, photographs, laboratory notebooks, and/or artifacts from a number of distinguished and prominent scientists such as, Maurice Fox, Rosalind Franklin, Raymond Gosling, and Herbert Wilson as well as Nobel laureates Sydney Brenner, Francis Crick, Max Delbruck, Aaron Klug, James Watson, Maurice Wilkins, Max Perutz, and Sir William Bragg. For more information please read the Norman collection press release. J. Craig Venter Collection is comprised of correspondence, manuscripts, speeches, research papers, media events and coverage, as well as other materials which document his major scientific contributions. Hamilton O. Smith Papers includes primary source materials such as correspondence, grant applications, laboratory notebooks, lectures, photographs, Nobel Prize related materials, and manuscripts on various subjects including recombinant DNA H. Influenzae, and DNA methylases. Sorcerer II Collection contains materials relating to the global oceanographic genome project carried out during the Sorcerer II expedition. Materials include marine charts, log books, and various other data.